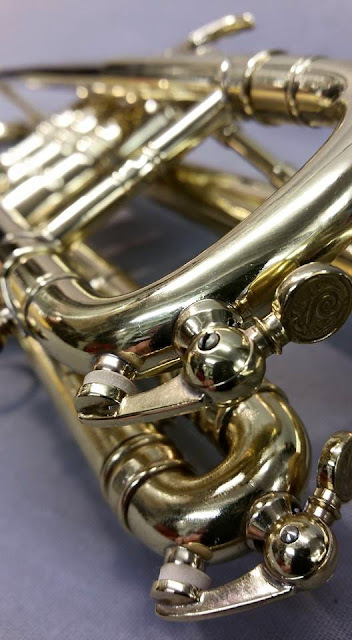 Being a life long Louis Armstrong fan and a trumpet player I have always fancied owning one of the distinctive trumpets Louis was known for playing. Over the years I have seen a couple of the 1930's versions for sale. 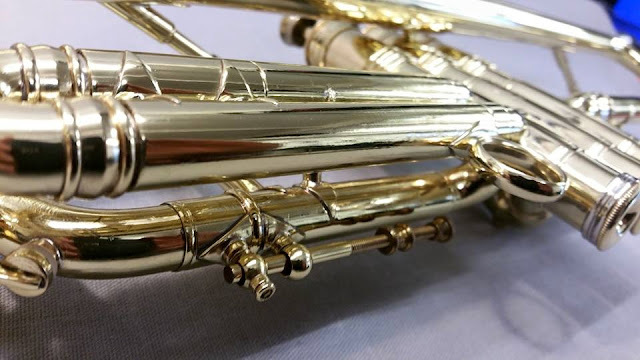 These were made in a frosted silver plated finish and have Louis Armstrong Special engraved on the bell. There was also a version with Nat Gonella's name on the bell. 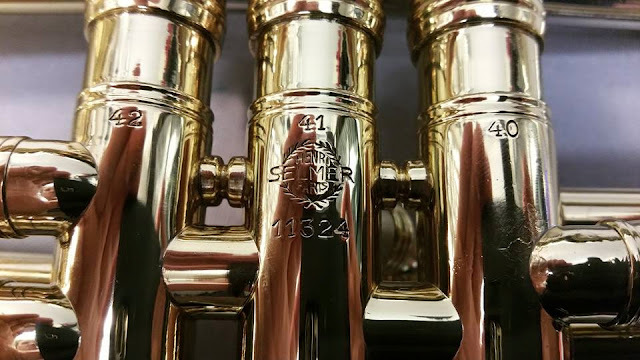 The post war Selmer balanced models were not very popular in the UK so there are not many available second hand and most are the larger bore model 23 or 24. 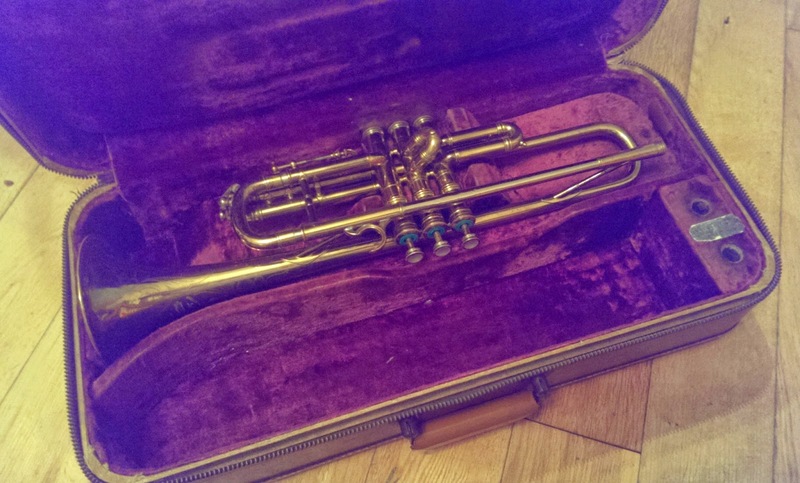 I recently had a problem with a flugel horn case that went mouldy and in my search for a replacement i came across an instrument repairer who had a number of vintage instruments for sale. This included a 19A and 23A Selmers in the balanced configuration. These had been traded in at some point in the past, but he had hung onto them because they were so unusual. The 23A was in poorer condition and in need of a valve job, but the 19A was in its original case and had been well played, but well looked after. There are a few tiny dents (the usual music stand dings) but barely noticeable. 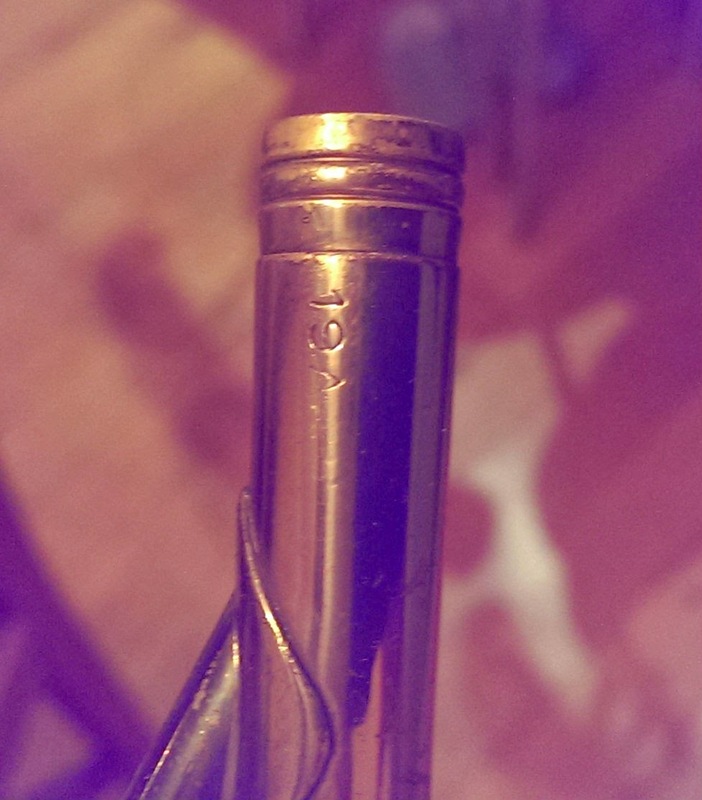 The serial number dates it to 1952, but valve compression is practically as it was when new. 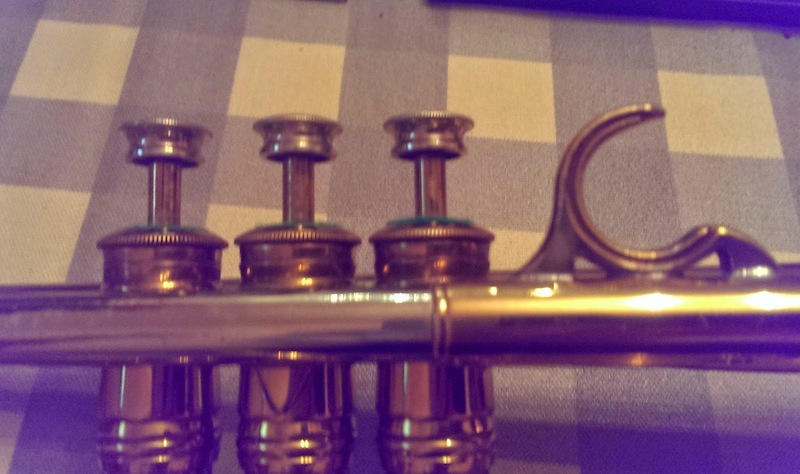 I know who owned the instrument originally and it may have been purchased new in the USA. 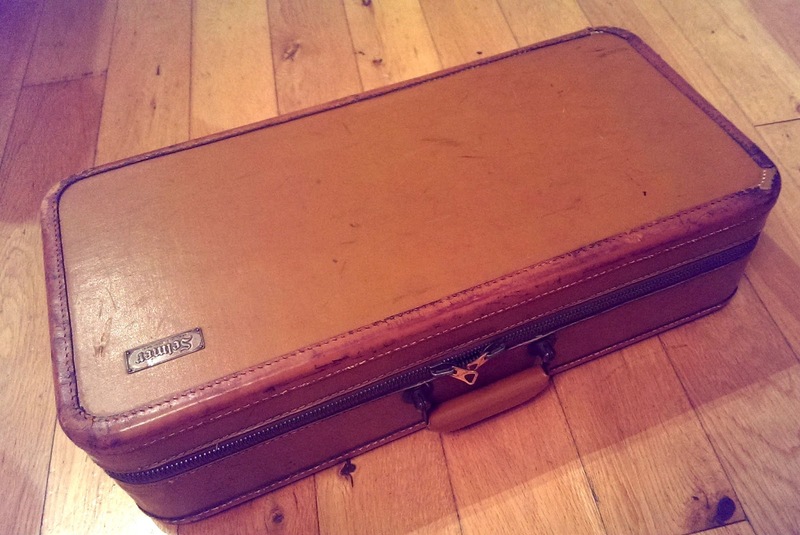 This is a zip up case with a badge that says Selmer USA on it. 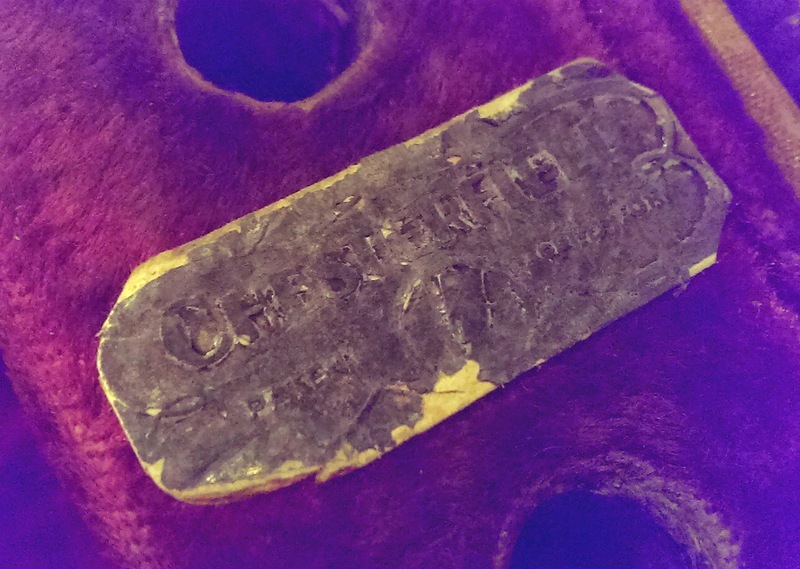 A totally faded lable inside turns out to say "Chesterfield patent" on it when I took a photo and adjusted the brightness and contrast on it. 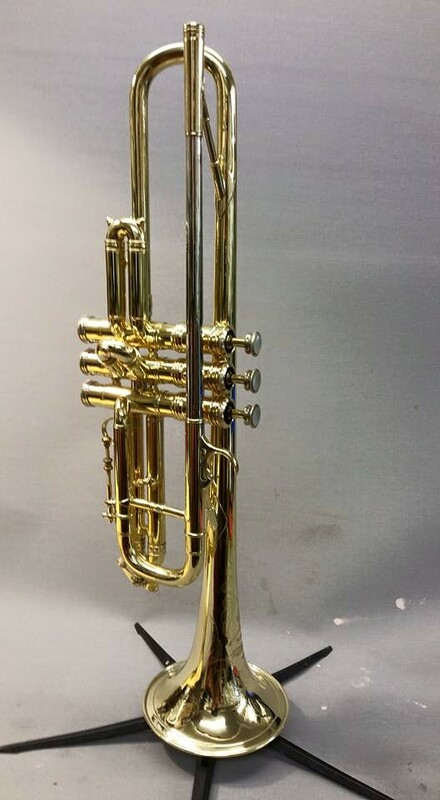 It is clearly the original case, or at least made for a balanced trumpet as all the cut outs are in the correct place and there is no sign of modification. The instrument has some decorative engraving on the bell, measures to 0.450" bore size (small bore) and has 19A stamped on the receiver. 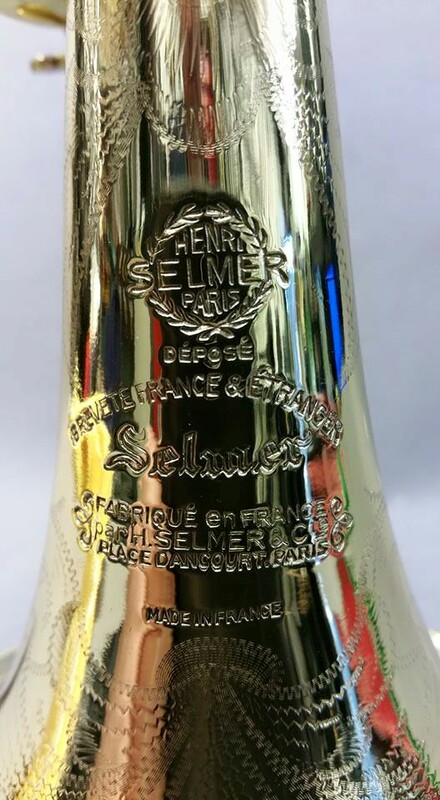 There are no other markings other than the serial number and usual Selmer stamps on the bell. It has the original stop rod for changing it to the key of A. The bell is small by modern standards with a very slender profile and a reinforcing ring/garland next to the rim. The ring on the third valve slide is below the slide. The instrument has about 75% if the lacquer remaining on the bits that are supposed to be lacquered. 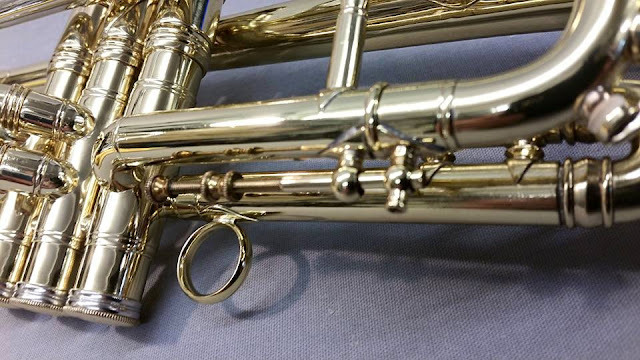 I am tempted to have this redone by a good restorer - as much to preserve the metal as to make it look better, but as it stands it has a lot of character. Stop rod for A and underslung adjustment ring. Characteristic Selmer Paris pinky ring. 19A stamped on the receiver indicating a .450" bore, which is what it measures to. Decorative engraving on the bell. 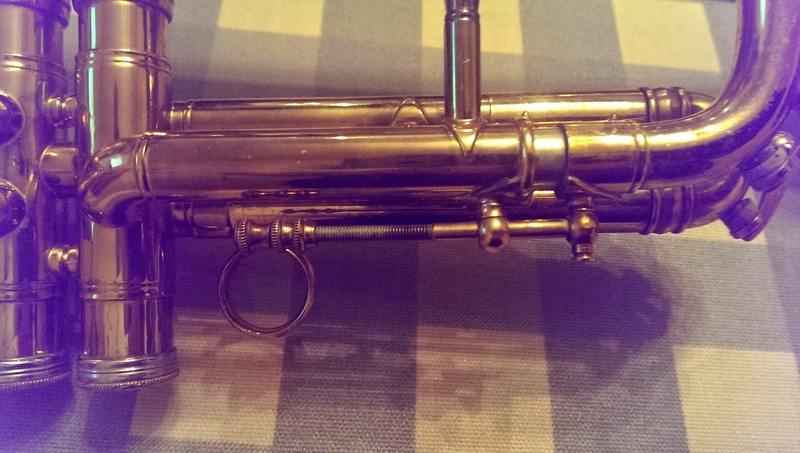 It plays more openly than I expected for such a narrow bore model and compared to 1930's pea shooter style trumpets. It has that characteristic carrying sound with not many overtones. It is not a loud instrument and won't take a huge amount of air. The receiver is old style French which means a modern mouthpiece will not insert far enough. Here are some mouthpiece gap measurements using one of my Breslmair mouthpieces as an example. This gives me a gap of 10.35mm which is far too big. This gives me a gap of 8.86mm which is still too much. 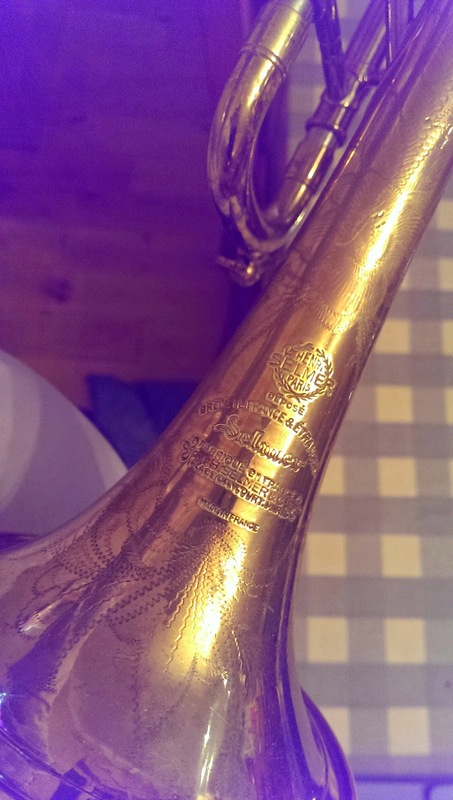 I decided to have the instrument restored and this was completed in August 2015 by Bryce Ferguson at Brass and Woodwind. Bryce specialises in instrument restoration and does work for museums and many other organisations. Because I needed a useable instrument I decided to go for modern epoxy laquer which evokes the very bright look of some of the later gold plated Selmers used by Louis Armstrong. 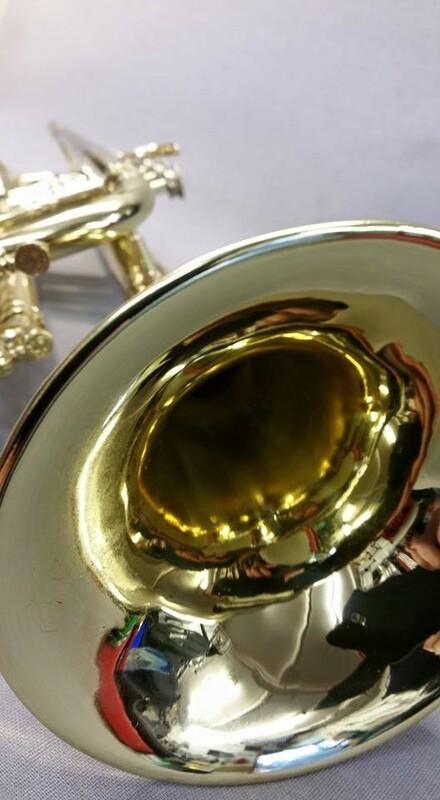 The restoration included straightening out a minor bend in the bell, removing as many dents as possible from the lead pipe, doing a full ultrasonic clean and then removing lacquer chemically before hand polishing to ensure the engraving stayed sharp. Then lacquering and plating of the silver parts. It also had a valve alignment which is really crucial given the narrow bore. Interestingly Bryce discovered a shunt slide on the third valve which I had not noticed as it was totally seized. 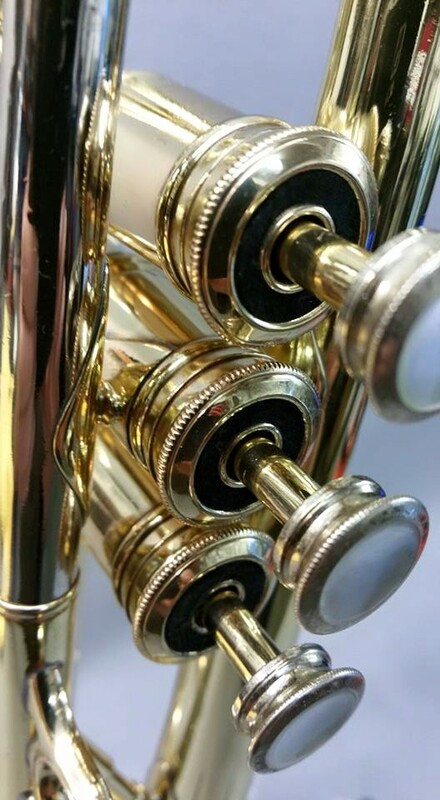 The compression on the valves is very good for an instrument of its age. Hopefully this will give it another 63 years of life! Is Virgin Galactic really about cutting edge space exploration? I had not thought about this until the crash this week, but a lot of the news coverage has focused on how cutting edge the Virgin Galactic programme is and how dangerous space exploration is. However, we have been going into space for over fifty years. A quick comparison of Virgin Galactic with the US Mercury space programme (Project Mercury) makes interesting reading. We were sending people into space over fifty years ago so going into space is not cutting edge. Reusable spacecraft were pioneered 25 years ago with the space shuttle. It seems to me that if Virgin Galactic is an experiment, then it is an experiment in economics rather than in space exploration. Its about how money can be made from space rather than how we get there or why we should be going.